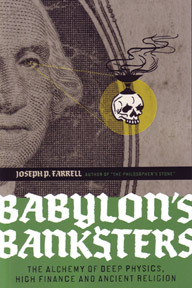 The modern-day financial crisis and scam is nothing really new reveals master researcher Joseph P. Farrell in Babylon’s Banksters. Banking has been tinkered with and controlled for the past thousand years of human history. See how a seductively simple formula devised by a large and powerful Chinese family led to the “credit default swaps” bust. Read how astrology and a fascination for gemstones played into the banking operations of the super-rich. What are the long-term goals of the most powerful international cabals? In this latest installment of his remarkable series of books of alternative science and history, Farrell outlines the consistent pattern and strategy of bankers in ancient and modern times, their desire to usurp the money creating and issuing power of the state, substituting a facsimile of money-as-debt. Here, Farrell peels back the layers of deception to reveal the possible deep physics that the “banksters” have used to aid them in their financial policies. Chapters include: Two Flies in the Ointment: Communist China and Nazi Germany; Historical and Conceptual Background; The Conspirator’s Postwar Détente; Hoover’s Hidden Legacy and Gift; Germany, RCA and J.P. Morgan: Cases of Interest and Suppression; The Temples, The Stars and the Banksters; Money, Monotheism, Monarchies and Militaries; Alchemy Upsets the Applecart: The Transmutative Medium and the Alchemy of the Stars and Banksters; The Monsters in the Machine; Sacred Sites and Scalar Temples: The Earth Grid and the Transmutative Medium; The Banksters’ Real Business: The Patttern of War, Scarcity, Suppression, Slavery and Monopolization; more. BABYLON'S BANKSTERS: The Alchemy of Deep Physics, High Finance and Ancient Religion By Joseph P. Farrell. 340 pages. 6x9 Paperback. Illustrated. References.